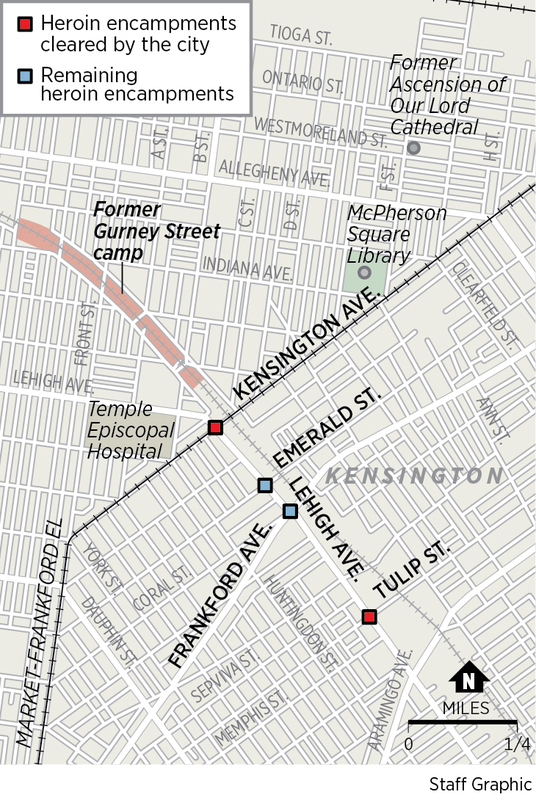 Philadelphia sweeps aside 2 heroin camps in Kensington. What happens now? Volunteers help Tiffany Prinski, left, pack up her belongings as police evict people living at the encampment on Kensington Avenue. Even as they celebrated clearing out two of the heroin encampments that have sprawled in Kensington for months, Philadelphia officials acknowledged they don't have the money to tackle the two remaining camps in the neighborhood, which have been growing as temperatures have become warmer. The camp at Emerald Street in particular is one of the longest-running in the neighborhood and the most difficult to clear because of its entrenched drug market. City officials have requested from $7 million to $8 million in the next fiscal year's budget for an overall opioid strategy that would include clearing that camp and its counterpart on Frankford Avenue. But City Council hasn't approved a budget yet. And so on Wednesday, city officials lauded "small successes," as Councilman Mark Squilla said at an afternoon news conference while sanitation crews sprayed down the sidewalks at the now-cleared camps on Kensington Avenue and Tulip Street. Meanwhile, protesters gathered on a street corner arguing that evicting people from the camps without enough shelter beds — and without an official safe injection site — could lead to more deaths in a city that had more than 1,200 fatal overdoses last year. Squilla had said Tuesday that Council would add money to the budget for more low-barrier housing, such as shelters and apartments that don't require residents to achieve sobriety before they can have a place to live. "We as a city do care, and we're not here just to move people off and move people out, we're here to get them help," he said at Wednesday's news conference. "We can make it even better as we move forward and put this pilot program into effect throughout the city of Philadelphia." City workers had been operating on a self-imposed deadline to clear the two camps by Wednesday, and only about 35 people remained there by morning. By the time trash trucks rolled through to collect abandoned tents, pallets, and other belongings, the last stragglers were carting out what they could carry. A handful of holdouts accepted drug treatment or housing services offered by the numerous outreach workers who walked through the camps on the last day of a month-long effort to address the latest open-air drug crisis to hit this embattled neighborhood. Around 120 people had already accepted some kind of city services; about 40 percent of those had entered treatment. The rest of the people who had been in the camps had either left already for shelters or a family member's home. One man on Tulip told outreach workers that his mother and sister had visited him in the camps the night before and were coming to pick him up. Others said they were planning to camp elsewhere. A few said they didn't yet know where they would sleep. >>READ MORE: How the opioid crisis is changing how Philly ER doctors treat patients. 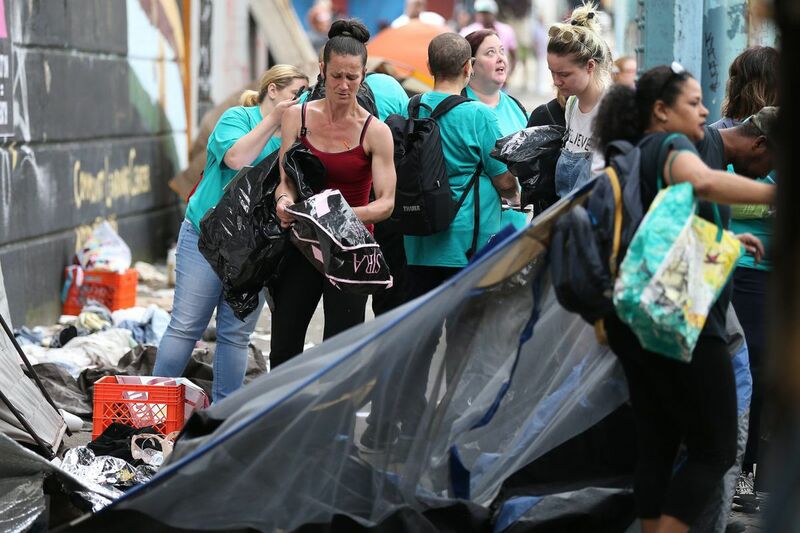 "My mind is spinning," said Tiffany Prinski, 38, who lived on the streets of Kensington for three years and in the Kensington Avenue camp for the last several months. She spent Tuesday night in her tent, wide awake and anxious, running through her options. A group of protesters had plastered signs under the Kensington Avenue bridge that read, "Eviction = Death," in an imitation of the AIDS activism group ACT-UP's "Silence = Death" slogan. In addition to their concerns about aggravating the overdose rate, protesters said the city didn't have enough nearby housing to accommodate all the neighborhood's homeless, a fact city officials readily admitted. The Office of Homeless Services had set aside low-barrier shelter beds for 110 people on a list of camp residents it had compiled earlier — anyone else seeking shelter would have to look for it in other facilities. "It's very painful for us to say we don't have beds for everybody, but it's part of the reality of the homeless system," said Liz Hersh, the city's director of homeless services. Her office has requested money for additional permanent housing in next year's budget. Kensington residents staged counter-protests on Tuesday night, saying that the camps were a health hazard for the neighborhood and that their children have had to pick their way past discarded needles and open drug use on their way to school. "We need our neighborhood to stop being like this," said Shannon Farrell, president of the Harrowgate Civic Association. "We are all for them getting help, but we're not in favor of them living here until they think they've gotten what they wanted." On Wednesday, police cordoned off the Tulip Street camp just after 10 a.m. and slowly walked through the train tunnel, checking inside tents for stragglers. Then sanitation workers scooped whatever had been left — tents, mattresses, pallets, tables — into a waiting trash truck. Sanitation workers remove debris along Kensington Avenue after police evicted people living at two of Kensington’s heroin camps. A couple who asked to be identified only by their first names, Mark and Sarah, walked up the block with their cat, Little Bubs, in a carrier. All three were moving into one of the city shelters on Kensington Avenue. They'd been living on Tulip since February, after shuttling between another encampment and two abandoned houses since last July. "I get what they're doing, because it is kind of insane allowing a homeless encampment under a public bridge. They're probably doing the best they can with what they have," Mark said. "But they're trying to force us into treatment because of this — I feel like it's going to go really wrong. It's going to displace everyone to somewhere else, and they're going to have the same problem again in a new location." A father and son, who had been living together in a tent on Tulip for the last two months, lugged a plastic bin of belongings, headed to pitch camp elsewhere. Brian Holzworth of Somerton walked past with a shopping cart piled high with scrap. He'd gleaned every bit of metal he could from the abandoned camp to sell at the scrapyard down the block. "I figured I'd capitalize," he said. He'd been living rough for a year, including on Tulip for six months, and didn't know where he would sleep Wednesday night, he said. Another sidewalk, perhaps. On Kensington Avenue, news cameras and neighbors clustered to watch the sanitation crews work. A few advocates helped Prinski, now wiping away tears, dismantle her tent. Outreach workers in orange shirts encouraged her to walk down the block to a nurse who could treat an abscess on her forearm. "It's always uncomfortable," said Kate Perch, the housing coordinator for Prevention Point, watching the cleanup on Tulip Street. Prevention Point is running two of the city shelters that have opened to accommodate camp residents. "We knew it was coming, and felt like all of us in the initiative did the best we could to engage people. And that's not stopping just because [the camps are being cleared]."